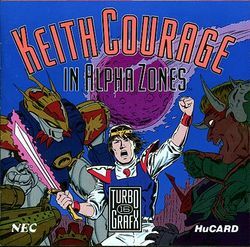 Keith Courage in Alpha Zones is a 1989 science fantasy action platform game by Hudson Soft that was released for the PC Engine/TurboGrafx-16. It was the initial pack-in game in North America for the TurboGrafx-16, before being replaced by Bonk's Adventure in 1991. The game was originally released in Japan on August 30, 1988 for the PC Engine, under the title Mashin Eiyūden Wataru (魔神英雄伝ワタル, Mashin Eiyūden Wataru? ), which is adapted from the anime television series of the same name. The game is a platformer action-adventure game, but it sports two different styles of play depending on whether the player is above (overworld) or below ground (underworld). There are a total of seven levels in the game, each of which is broken into two areas, the overworld and underworld. Overworld areas consist of simple rightward travel and platform hopping. In the overworld, one controls Keith Courage in his human form, using a small sword to fend off enemies which take the form of birds, moles, and even cats that drop from the sky. Keith can also enter buildings and buy power ups. Upon reaching the end of the overworld level, Keith is transported via rainbow to the underworld, whereupon he adopts the Nova Suit. The underworld levels are more complex and menacing than the colorful overworld, with aggressive nightmare creatures and a larger landscape to travel with more of a focus on navigating not only horizontally but also vertically. At the end of each underworld level is a boss. The gameplay of the two versions is the same but the story is different. The Japanese version is based on the anime Spirit Hero Wataru. The main character in this version is Wataru Ikusabe (戦部ワタル, Ikusabe Wataru? ), who is a fourth grade primary school student. The Nova Suit is called "Ryūjinmaru" (龍神丸, "Ryūjinmaru"? ), and is beckoned by Wataru with his sword. The game takes place in "Sōkaizan" (創界山, "Sōkaizan"? ), a seven-leveled mountain which has been occupied by the king of Makai (魔界,, Makai? "World of devil"). Wataru is the "Kyūseishu" (救世主, "Kyūseishu"? Savior), and must liberate Sōkaizan from the devils. This page was last edited on 17 July 2016, at 00:53.